Daily Illuminator: "I Am Granicus!" "No; I Am Granicus!" March 19, 2012: "I Am Granicus!" "No; I Am Granicus!" Actually, Granicus is a planet. A pleasant, ordinary, not-at-all-criminal planet. Nothing to see here! (Psst! Are the authorities gone?) All right; here's the skinny. Let's say that you've got yourself a spacefaring operation that veers a bit toward the "freelance" (pirate) side of things. And perhaps you need a place to unload your (pirate) goods, or hang out with likeminded individuals (pirates). Then Granicus may be just the world for taking care of business. 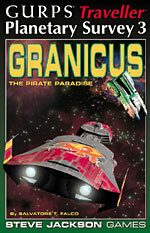 GURPS Traveller Classic: Planetary Survey 3 - Granicus has what you need to bring this pirate haven to your science-fiction universe. It's got the history, map, customs, and other info required to bring Granicus to life. It also has adventure ideas, plus insights on how to make this pirate paradise lighter or darker as the campaign requires. So the next time you have extracurricular (pirate) activities, or are someone looking to investigate such activity, take a trip to Granicus. Just make sure you buy our handy travel guide first!